Secretary, Board of Directors Protectors of Animals, Inc.
James Breen is a member of the Financial Management Leadership Development Program at Travelers. 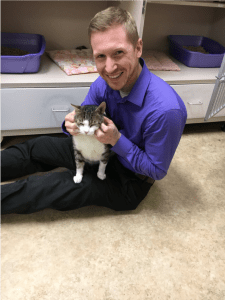 James joined Protectors of Animals in July of 2016 as a Socializer for the East Hartford Cat Team, and in April of 2017 he joined the Board of Directors as Secretary. James holds a Bachelor's Degree in Criminal Justice and a Master's Degree in Accounting from the University of Wisconsin-Milwaukee. James is a Certified Public Accountant in the state of Connecticut.